This carol is moderately popular around the world, but has not entered the canon of most popular carols. 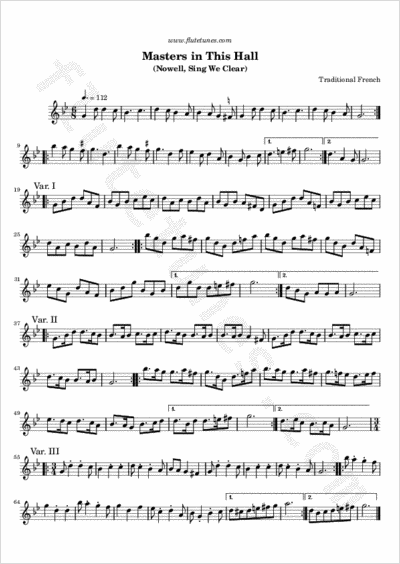 The original French tune, which can be traced back to the late 1600s, was included in Raoul Auger Feuillet's 1703 Recueil de contredanse along with a longways proper dance, “La Matelote”, which Feuillet had himself written to go with the tune. The French composer Marin Marais included this dance in his 1706 opera Alcyone, with the title “Marche pour les Matelots”. In 1710 John Essex published a translation of Feuillet's work, For the Further Improvement of Dancing, in which the dance is given as “The Female Saylor”. It is unclear, however, whether the tune entered English folk tradition at that point, or whether it was reintroduced later. Anyways, it was William Morris, best known as the founder of the Arts and Crafts Movement, who fashioned this carol when he provided, around 1860, words for the tune. The tune as it is usually played today shows a couple differences with respect to Feuillet's version, notably regarding the alteration of the seventh note of the scale. In the sheet music, these few changes are marked above the notes. To make things more interesting, we have also provided some variations on the theme, hope you'll like them.